Travel is a very pleasant form of recreation. 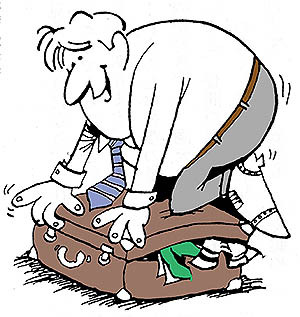 It has, however, one serious drawback---the need to carry baggage. A traveler cannot really enjoy himself as long as he has suitcases weighing him down. It is only when he has checked them in at a railroad station, or deposited them at a hotel, that he can walk around and enjoy the sights. The same is true of life. We are all travelers, and we all have baggage to carry. There are two bundles, in particular, which to tend to weigh us down. One is marked "Regrets about the Past." The other bears the label "Fear of the Future." Physical pain is felt only in the present. Most of man's mental suffering is caused by worry about either past mistakes or possible future calamities. Neither regrets concerning the past nor fears about the future accomplish any good purpose. What is past is past. No amount of worry will change it. A past mistake may well serve as a warning for the future. As far as the future is concerned, we really have no way of knowing what is going to happen. It is very easy to imagine all kinds of calamities, and it is very common for people to worry about many misfortunes which might possibly occur. In reality, however, most of the things which are worried about never happen. To enjoy the trip we are taking through life, we have to discard this baggage. Only when we have set aside worries about the past and future, can we make the most of the life we are living in the present.